Not long after I started out jogging a friend of mine at work signed up for a 5K Race for Life after finding out that a friend of hers had been diagnosed with breast cancer. She wasn’t a runner at the time and I was really impressed by her decision to do something that was going to challenge her so much but enable her to raise money for charity and feel like she was doing something positive. 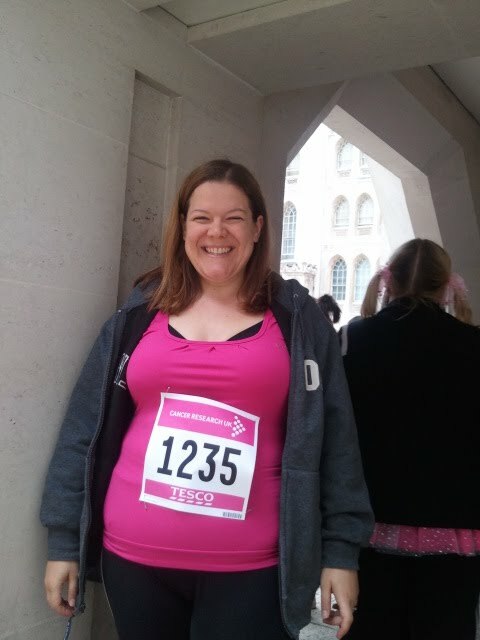 Inspired by her decision I found myself wondering if I could manage to run a 5K and before thinking about it for too long I signed myself up for the City of London Race for Life. At the time I remember thinking that 5K was a really long way, given that I was still only managing to run for a few minutes at a time. I’d tried to run a 5K race before but had found the training really difficult and had ended up walking half the distance. I decided this time would be different. I found a brilliant website called http://www.runningintoshape.com where I downloaded training podcasts to see me from ‘Couch to 5K’ The training programme was great, gradually increasing the periods of running in small but manageable amounts. Each week I made steady progress – I remember the first time I ran for 20 minutes non stop – it felt like such an achievement. 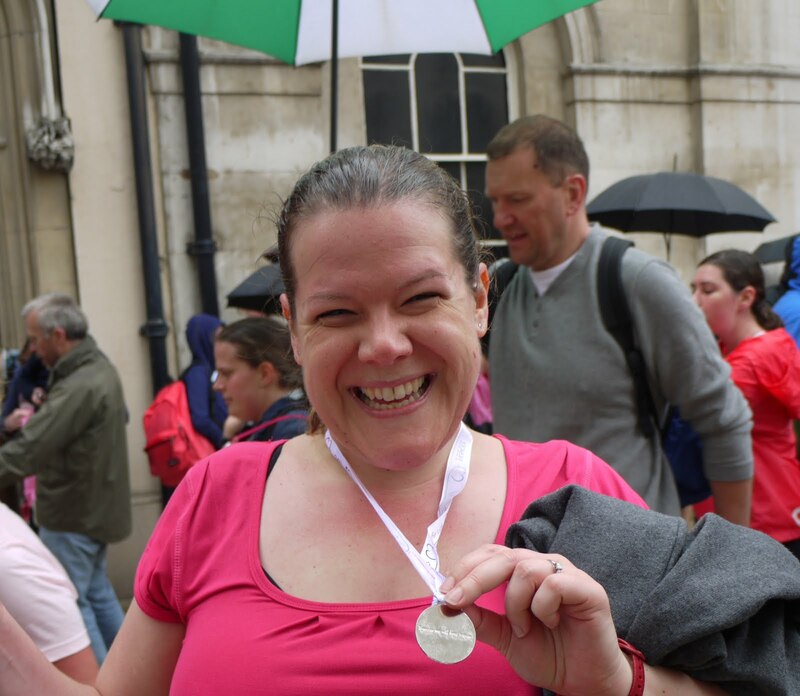 So 9 weeks later I found myself lining up in the cold and drizzle near the Guildhall in the City of London ready to take part in my first 5K race. I really enjoyed the first two miles of the race, I felt confident and enjoyed the atmosphere and the crowds cheering us on along the route. The last mile and a bit I found very challenging, but I kept going, cheered on by my husband until I crossed the finish line. My time was 38minutes, not fast by anyone’s book, but 2 mins faster than I’d ever been in training. I felt elated and exhausted at the same time. 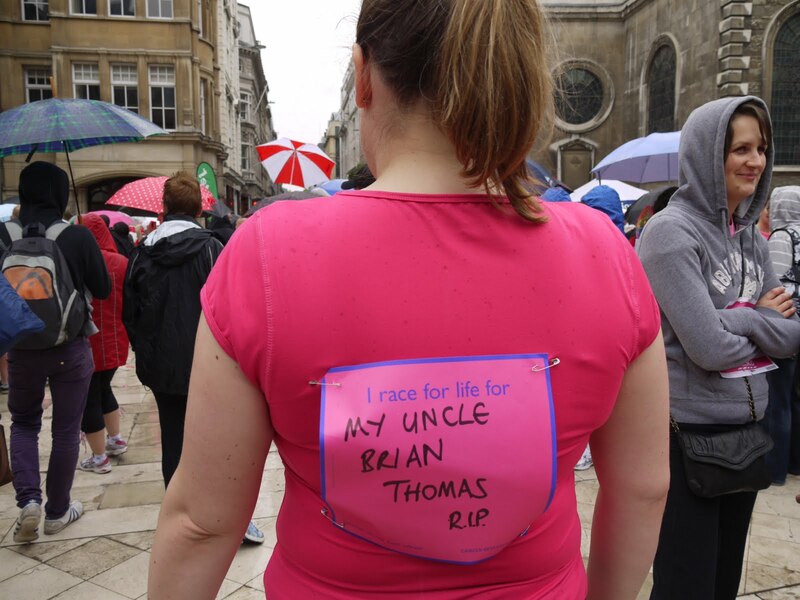 I would really recommend Race for Life for any woman who is thinking about taking up running. The events are well organised, and cater for runners, joggers and walkers. 5K is an achievable distance and the training can be fitted in pretty easily. If you’re reading this and thinking “I couldn’t do that” believe me – if I can, you can! Couple of things. Firstly you look so amazingly smiley in all your photo's when you are running. You are amazing. And omg, you've lost so much weight since this photo – well done you! I always smile in photos. I used to hate all photos of me and then one day figured out that if I smiled I didn't hate them that much. Since then I have developed an almost pavlovian reaction to seeing a camera – massive cheesy grin, regardless of what I'm doing or what pain I'm in! And thanks for the comment on the weight loss. It's weird – I can't see it that much but I think when you see yourself in the mirror everyday it's more difficult to notice.